Americans love space. From our national parks to our quarter acre yard, we cherish the open land around us. In suburban America parks and recreation are as important to a community as just about anything else. Wikipedia sums it up pretty well: “Recreation is an activity of leisure, leisure being discretionary time. The need to do something for recreation is an essential element of human biology and psychology. Recreational activities are often done for enjoyment, amusement, or pleasure and are considered to be ‘fun.’ ” Every family household, community organization and even businesses, try to incorporate “fun,” or recreation, somewhere into their routine. Parks and recreation are so important that there is an organization whose sole purpose is to provide, foster and promote recreation: the Lisle Park District. Over 400 acres are protected by the Lisle Park District. In addition to the recreational benefits, this land contributes to improved water quality, protects groundwater, helps prevent flooding, improves the quality of the air we breathe, and provides a habitat for wildlife. Most residents agree that a quality park system is very important to their quality of life. Study after study show that access to parks and recreational opportunities is linked to reductions in crime and to reduced juvenile delinquency. Parks improve the local tax base and increase property values. Parks and recreation generate money for the local economy. The Park District is a critical component of the community because it enriches the lives of those in it while improving health and wellness; building self-esteem; boosting the economy; protecting the environment; educating children and adults; reducing stress; creating memories; increasing community pride; eliminating loneliness. The Lisle Park District stands apart for its attention to those with special needs, senior citizens, and for its environmental excellence. Established in 1967, the Lisle Park District provides leisure activities for people of all ages throughout the year. The 110 acre Community Park is the focal point for outdoor sports and special events in the Lisle area. Park district’s 400 total acres feature 45 parks and facilities including the Recreation Center which houses Gentle Learning Preschool, SEASPAR, the Senior Center, Community Park Fitness; Sea Lion Aquatic Park; River Bend Golf Club; Wheatstack—A Midwestern Eatery & Tap; and the Museums at Lisle Station Park. Numerous neighborhood playgrounds and parks offer amenities such as tennis courts, basketball courts, ballfields, and picnic areas. The Lisle Park District is proud to host one of the greatest 50+ programs in DuPage County with social programming, trips and events designed specifically for adults 50 and over. The district even publishes a special bi-monthly newsletter entitled The Prime Times. For more information about the Senior Center, please call 630-969-0992. The Lisle Park District works cooperatively with the local school districts for joint use of facilities and is a member of the Southeast Association of Special Parks and Recreation (SEASPAR), an organization that provides year round recreation programming and services for residents with special needs. SEASPAR’s Lisle facility features interactive equipment to soothe the senses, cooking, art, computer skills, social activities, and an additional site for the “EAGLES” program. 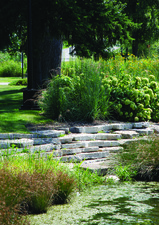 The Lisle Park District has made great strides in becoming an eco-friendly leader within the greater Lisle Community. Since its first Environmental Committee meeting in 2008 the disctrict has been implementing programs to meet long and short-term goals for environmental protection and advocacy. Did you know that 70% of the world wears secondhand clothes? The Lisle Park District has partnered with USAgain to host a dropbox for recycling textiles in the Community Center parking lot located at 1825 Short St. in Lisle. USAgain is a for-profit company that collects unwanted textiles and resells them in the United States and abroad, effectively diverting millions of items of clothing from landfills, generating new revenue streams for U.S. business and non-profits, and fueling local economies in emerging countries. • Updating IPRA Environmental report card to highlight all the environmental initiatives accomplished over the past year. • Started Paper Retriever program with bins at both Community Centers. • Began Bottle and Can recycling program at Community Park and at SLAP. • Parks Department continues to recycle scrap metal. • Parks Department replaced pick-up truck with new Ford Hybrid vehicle. • Sea Lion Aquatic Park Concessions eliminated using Styrofoam cups. • Community Park Fitness eliminated paper cups and replaced them with reusable bottles to all members. • Recently began buying recycled office supplies. • Added tag line “Please don’t waste paper!—consider the environment before printing this or any other emails” to all staff emails. • Replaced Meadows Center light bulbs with CFL Light Bulbs that last longer and lowers energy costs. • Started crayon recycling program at Meadows Center and Community Center. • React Computers continue to recycle staff’s old computers. • Working with the Village of Lisle on Safer Pest Control Project for use at Museum at Lisle Station Park as a test site to use organic fertilizer. • Camp Summer Quest provides BPA free recycled water bottles to each of its campers to cut down on the number of plastic water bottles used.